"We were once the dream, must we choose to be slaves to gravity." It just so happens that the concept of cinema being "dead" is being tossed around right when I watched The Fits. Cinema is alive and well. Perhaps some people just aren't looking hard enough. It's a coming-of-age story, but that's putting it unfairly simple. Light on dialogue, heavy on powerful imagery, this story told by writer/director Anna Rose Holmer checks in at a lean 70ish minutes in length and it flows so perfectly you couldn't add or cut a single thing. 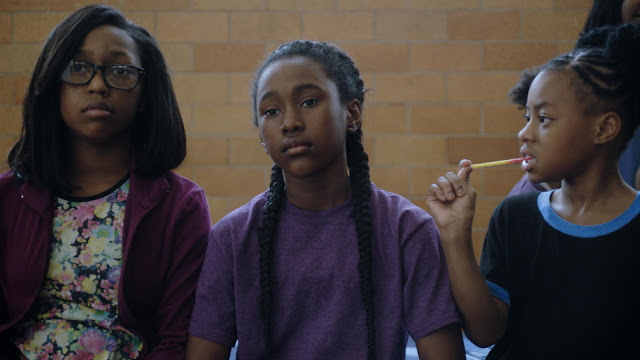 Toni (Royalty Hightower) is an eleven year old girl spending most of her time training to be a boxer with her older brother at an inner city community center in Cincinnati. The opening sequence of the film is nothing more than Toni doing sit-ups while looking into the camera, yet it develops the character with shocking simplicity because we can see the strength already. Using the same building and practicing in a room nearby is an all-girl dance team, and Toni can't help but watch them perform with fascination and envy. She leaves her comfort zone by deciding to join the squad, but she struggles to fit in and find her rhythm. Prior to sitting down to watch the film, I had not given the title all that much thought, but when I started to understand what it might be referring to I was surprised by the direction of the narrative. Instead of being solely about a girl practicing her moves, hoping to be a part of this team, soon after Toni joins the group a few of the other girls start to experience mysterious and scary episodes including seizures. As a person who dealt with epilepsy during my adolescence, I found the suddenness of this development to be jarring, but not in a bad way. It was a jolt of energy and intrigue into a picture that felt like it might be headed down a conventional and familiar path. The performances across the board were excellent and the portrayal of these "fits" felt so real, and yet what they represent is probably not as literal as it seems. They are blamed on the public drinking water in the building, and given what we now know regarding the decision making in Flint, Michigan and their lead-filled water and the systemic racism that plagues that level of tragic misconduct, it's interesting to see it used in the plot as a health hazard given that this film takes place in an underdeveloped African American community. Given the way these episodes are filmed and the excellent yet ominous musical score that plays throughout the film, it almost feels like The Fits is destined to hit a truly startling tonal shift and become a horror film near the end, but it doesn't happen. Whatever it is that is causing these girls to seize and vomit, they survive and come out the other side seemingly sans concern, and it's obvious that we as an audience are waiting for Toni to be next much like I'm sure the character is as well. When it does happen, and it does, it results in one of the best sequences of any film in 2016, a finale that is jaw dropping and perfect. With a brilliant breakthrough performance from Royalty Hightower, The Fits is a film that has so much going on while seeming short and simple. It's made with raw confidence that makes every single shot feel real, portraying the repetitive nature of anything that requires hard work and practice in order to achieve success with an authentic honesty. Whether through punches, dance moves or running up and down steps, Toni is a girl facing circumstances that so many face, that of an underprivileged child whom the world is trying to leave behind, but it's clear from that opening shot that she is fighting to be so much more. Every scene after this serves to reinforce this notion. 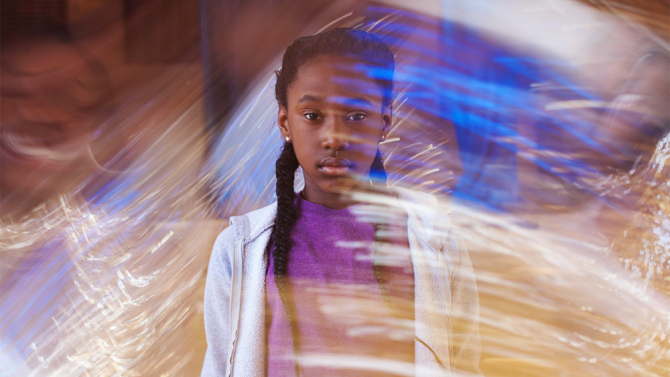 The Fits is one of the best films of the year.